Marsh & McLennan Companies is the premier global professional services firm providing advice and solutions in risk, strategy and human capital. Through their market leading brands, colleagues in more than 100 countries help clients identify, plan for and respond to critical business issues and risks. The core of Marsh & McLennan Companies’ CSR philosophy is “the pledge to care for the development of our own colleagues as well as the communities in which we operate”, with the CSR mission of “Helping people and communities at risk, through education and disaster relief”. As soon as the company’s Corporate Leaders in their New York headquarters learned about the disaster left by Typhoon Haiyan, the decision to donate US$50,000 was immediate. Simultaneous overwhelming relief drives were also initiated by the employees of Marsh, Guy Carpenter, Mercer and Oliver Wyman in different countries around the world. Last May 5, 2014 the donation was turned over to Gawad Kalinga. Marsh & McLennan was represented by Ms. Rose Kwan (Country Leader for Mercer Philippines, Inc., ASEAN Business Leader for Mercer Marsh Benefits) and Mr. Ramon Zandueta (President and CEO for Marsh Philippines, Inc., Country Corporate Officer for Marsh & McLennan Companies in the Philippines) while Gawad Kalinga was represented by Mr. Mike Goco (Chief Finance Officer and Member of the Board). 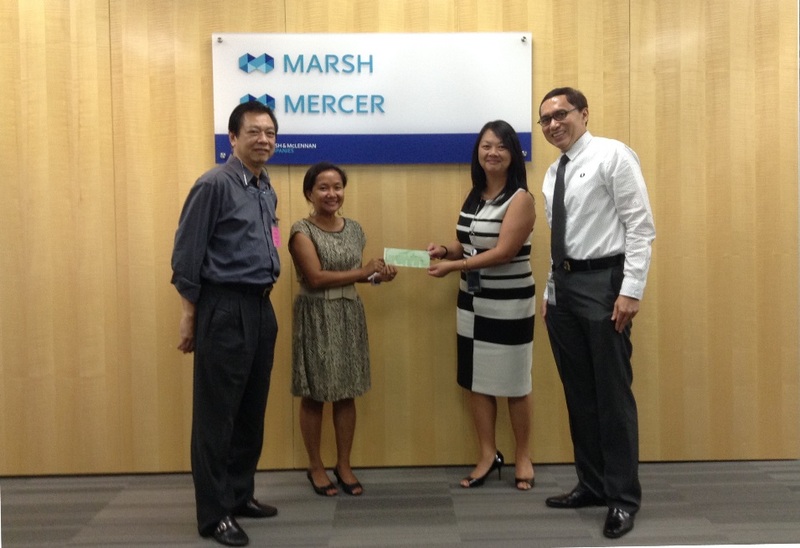 Thank you Marsh & McLennan Companies for extending help to the families in Capiz. Soon 18 families will move to their permanent homes and it will forever be a symbol of hope and the promise that you will not leave them behind. Through the combined efforts and resources of partners, volunteers, GK workers and our very own residents, we have made significant headway in our roof repair, Balangay (fishing boats distribution) and housing reconstruction. Like Marsh & McLennan, you too can be part of Operation Walang Iwanan and help GK in rebuilding. We need YOU to help SCALE UP so we can each more families faster.